Star Wars: The Clone Wars is really growing on me as a TV series. Smart, flashy, and full of unique plots - its appeal is much broader than what many people give it credit for. Unfortunately, LucasArts marketing seems to be a slave to that same stigma, because Krome Studios has flown on their dime and landed square in Little Tykes Land...and the irony about all of this is that the LEGO Star Wars games won the hearts of adults while action-oriented platformer/brawler/shooter Star Wars The Clone Wars: The Republic Heroes gets watered down for simplicity's sake. Swinging a lightsaber is straightforward, since Krome decided to go with classic third-person melee controls. A small variety of context sensitive combos and a Force Push button makes the combat somewhat fun but mostly bland. Most of the reviews that I've read for this game pan the platforming - to be honest, it's almost too easy. You literally can't fall as long as you let go of the analog stick before you land. Most of the reviewers probably suffer from Tomb Raider Syndrome and have a strong habit of wanting to control the characters momentum; here, the idea is to let the character land where you've directed already. It's very simple and despite being annoying for a while, it's smart - because the camera angle is mostly locked, and you wouldn't have a prayer otherwise. Without a combat or puzzle aspect, it just becomes a tedious task to get from point A to B. When you put on a Clone Trooper's armor, though, it becomes a whole different game. If Jedi jumping makes you upset, don't worry: according to this game, Clones can't jump. Instead, you're given the abilities to crouch and to vault over objects. These are both used when behind cover, although the game doesn't have an actual cover system per se. Crouching behind an object protects you, and if you're close enough to that object, your character will pop up or to the side intuitively when you shoot at enemies. Speaking of shooting: your aim and fire controls are mapped to the right analog stick, so that hold it in a certain direction sprays a stream of blaster fire. While I'm used to controls like this in games such as Geometry Wars and Undertow, it's not so enjoyable in a third-person shooter setting. Republic Heroes is incredibly long, coming in at 40 separate missions. All of them are fairly unique from each other...except when you have to fight the same boss at least five different times. It definitely helps to have a second co-op player jump in, and while the camera doesn't play nice, co-op is something Krome has done right with this game. Drop-in/drop-out co-op online or off is supported. Only two players can play together, but with this screen type (shared screen) it's the right number, I think. The game isn't complete garbage...I'd just say it's more along the lines of pointless. There are some cool unlocks - like lightsaber potency upgrades and wearable character masks - until you realize that the upgrades that affect gameplay take too long to earn, and the masks just turn your character into a big-headed no-clipping Jedi. 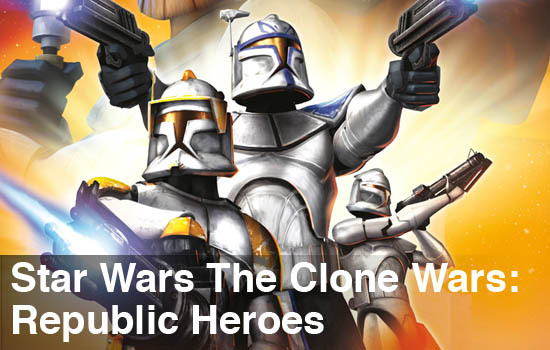 Outside of the unlockable items (and the extra Gamerscore for Xbox 360 players), the only redeeming value in playing the missions of Republic Heroes is the visual style and plot connection that it makes with the Cartoon Network series. The game literally picks up after one of the TV episodes, and hops around from there. Sadly, there is a huge gap in quality between the writing for the game and the writing for the show; all of the original voice actors make an appearance, but it doesn't help at all. After the first fifteen minutes of playing (oh, and by the way: mind the Yoda-themed tutorial pop-ups that just don't seem to ever stop coming...) I felt like I was wasting my evening. Even now, I'm completely unsatisfied with my chunk of playtime, which clocked in around four hours in total. I feel like no amount of Achievements could make me play this game through to the end, because despite it having serviceable controls and a story that I and my wife can follow...it's just pointless. 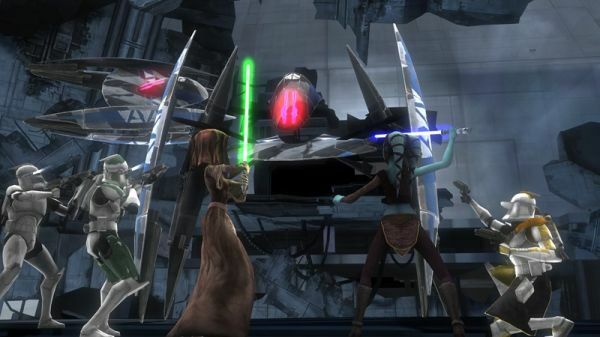 Very young Star Wars fans would have several hours of fun with Star Wars The Clone Wars: Republic Heroes. All others need not apply. 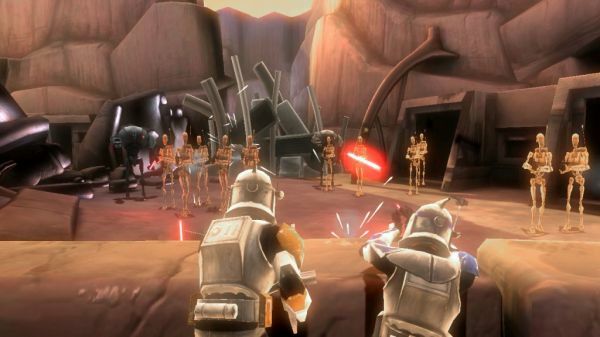 The Co-Op Experience: Star Wars: The Clone Wars -- Republic Heroes takes place between seasons 1 and 2 of the animated Clone Wars series and will feature a wide range of playable heroes, including Anakin Skywalker, Obi-Wan Kenobi, Mace Windu, Kit Fisto, and some of the clone trooper characters. You'll be able to play around with lots of force-enhanced powers and, best of all, work your way through the game cooperatively with a friend. Page created in 0.2798 seconds.